If you are using a PC with the Windows 8 operating system, please visit our help topic on "How to license Win2PDF with Windows 8". 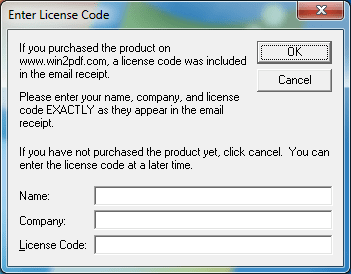 If you are using a computer with any other supported operating system, please use the following instructions to license your copy of Win2PDF. "Start->Programs->Win2PDF->Enter Win2PDF License". The following window will appear. Click on the "Enter license code" button, and enter your name, company, and license code exactly as they are listed in your email receipt. 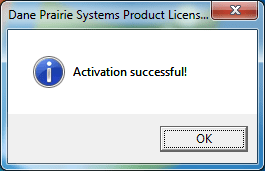 If you entered the information correctly, you should see a success message as follows. 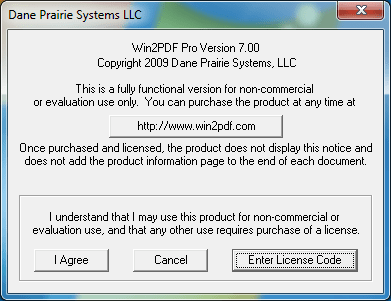 New documents created by Win2PDF will no longer include the trailer page on each document.